We were visited by Theresa Loots from South Africa who is visiting her daughter, Vicki Du Plooy. 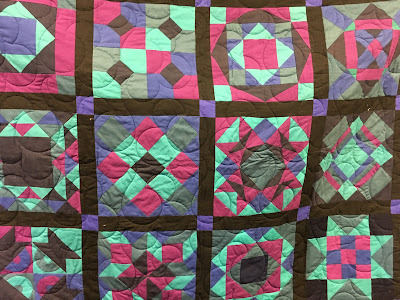 Theresa told us about her remarkable recent journey in quilting. 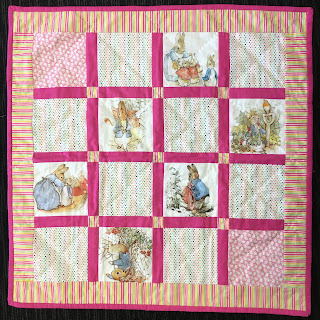 Having no patchwork experience at all, she decided to make her first quilt ever from a Dresden Plate pattern designed by Alyssoun Ryves which she found on the internet. 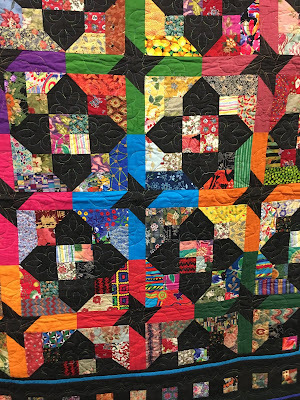 She was so inspired by the experience that she was determined to find out more about the designer of her quilt and tracked us down. 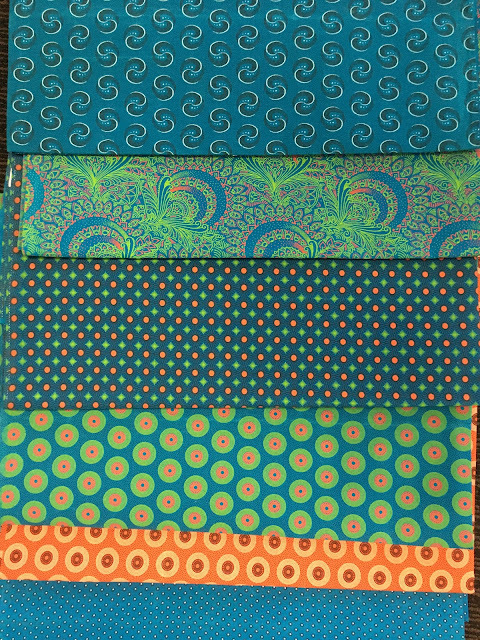 Theresa donated some Shweshwe fabric and has challenged us to make it into a quilt. She was then treated to a visit to Carl Ryves' house to view the original quilt. This Thursday is ANZAC Day so we won't be meeting. There will be a Wagga workshop on the following Thursday. The raffle quilt blocks which were meticulously prepared by Christie have been handed out. Please follow the markings very carefully and make stitches as small as possible. I do like my Thursdays. It is a very pleasant way to spend a day. I cannot join you next week and the following Thursday is Anzac Day. We will back as usual on May 2nd. * We received a very nice letter from the Womens' refuge that Robyn has introduced us too. They are very appreciative of the cot quilts and little teddies and bunnies that we have given them. 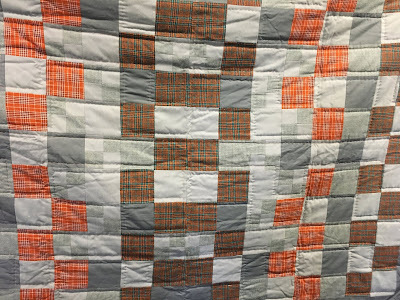 Making these larger cot quilts - 40" x 40" - is an ongoing commitment. If you have a spare moment, think about whipping one up. * Carolyn from the Grace Centre could not come this week. She will now come to collect the Kangaroo quilts and the baby quilts on 9 May. 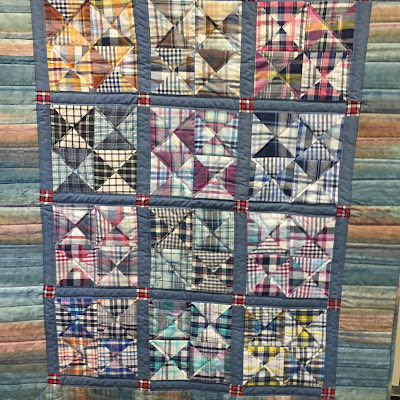 * Christie has been busy preparing the pieces for the Traditional quilt for our show next year. Next week Iris will have paper bags of the pieces to be sewn together including instructions. The pieces can be sewn by hand or machine. The pieces are quite small so hand sewing may be more accurate. 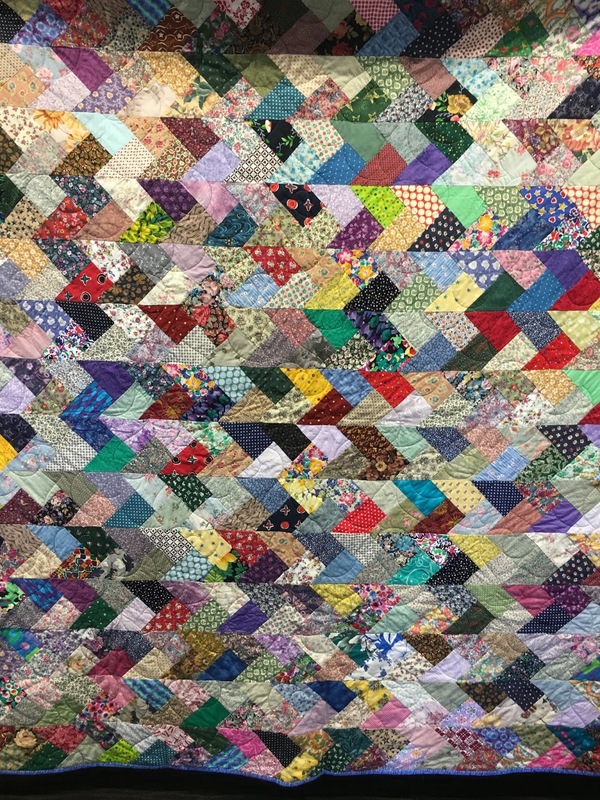 * Springwood Community Quilt Sow is on from Friday to Sunday 26-28 April from 10 am to 4 pm. 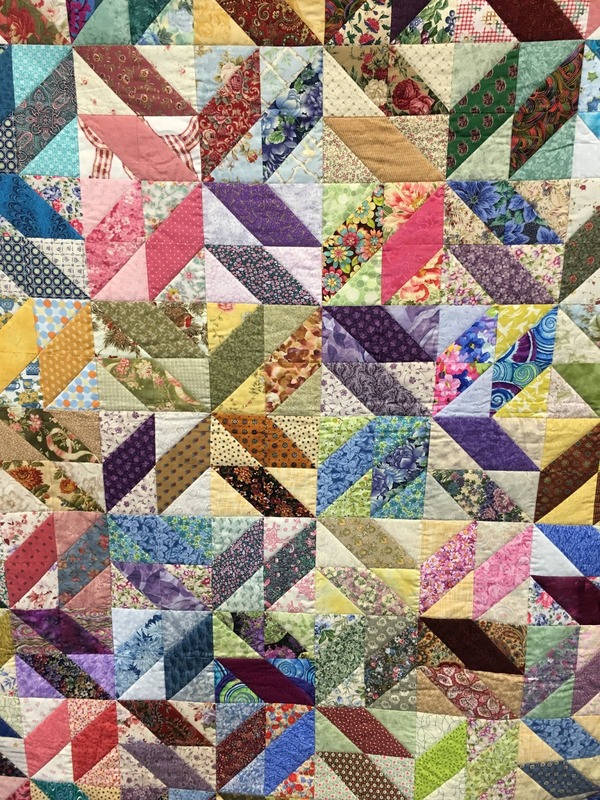 * Eastwood Patchwork quilters show is on from 3-5 May from 10 am to 4:30 pm. week from 9 am to 2 pm Monday to Friday. Jenny needs some 7" zips for the bags she makes for the show. If you see any at Achieve please pick them up for her. Grace and Helena will be conducting a Wagga Workshop on May 2nd. Grace has lots of tips and will guide us through the process. The waggas are the biggest seller for us at our show so making one is very well worthwhile. Cot quilt for the Womens' refuge from Grace. And two from Robyn S.
A baby quilt for the Grace Centre from Bev. And four from Carolyn. Carolyn's stash is never-ending. This pretty quilt is from Iris. It will be a quilt for Community. As it was Community Day this week, we held a workshop for the wonderful charity, Days for Girls. Janelle and her colleague arrived with two overlocking machines and two sewing machines. Some members had brought their own sewing machines as well as the two in our cupboard. We set to work and made 60 bags for the Days for Girls kits, cut up 6 metres of fabric which was sewn and holders for the pads were turned ready for use. It was a very busy and satisfying day. Janelle also showed a video of girls receiving their kits in Africa. The girls cheered when they were told the kits contained two pairs of underpants. They also understood that during their periods, they could still attend school. The work that Days for Girls does is amazing. We now have 25 members going to our retreat in September. if you want to come, please call Kurri Kurri to book your spot. Narelle has the details. Please let Narelle know once you have booked. 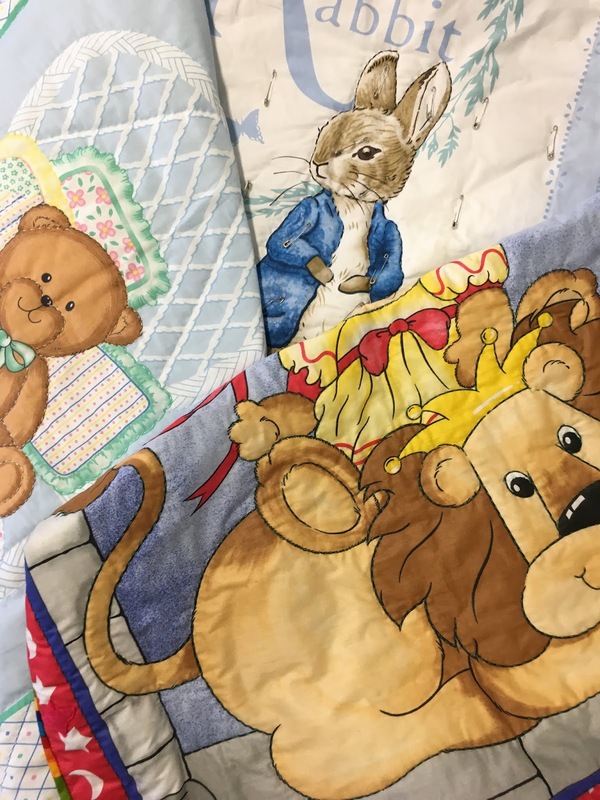 Members brought in 35 kangaroo quilts for the Grace Centre. They all look wonderful. These will be displayed at next meeting for us all to see. 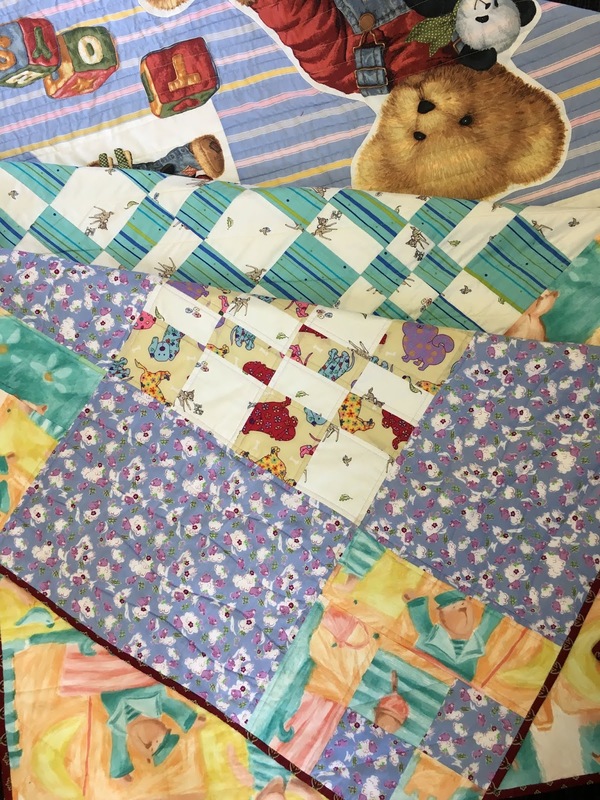 Members from the Centre will visit us next week to collect them as well as the normal baby quilts we have. They are having a 40% off sale for the next couple of weeks. Also a note that they no longer collect books. I have listed upcoming shows in recent blogs. The Eastwood Show at Brush Farm House will be held in early May from 3 to 5th, 10 a.m. to 4:30 p.m.
April 25 is Anzac Day. As the day falls on a Thursday this year, there will not be a meeting on that day. Helena has asked me to advise you that she will be holding a Wagga Workshop on 2nd May. Winter is approaching and we need to start making Waggas to sell at our show next year. What better time to learn how to make one and give it a go. Helena made the cot quilt below from some fabric she purchased in Scotland. Robyn will take it to the Mothers and Babies Refuge together with the other cot quilts we have made. 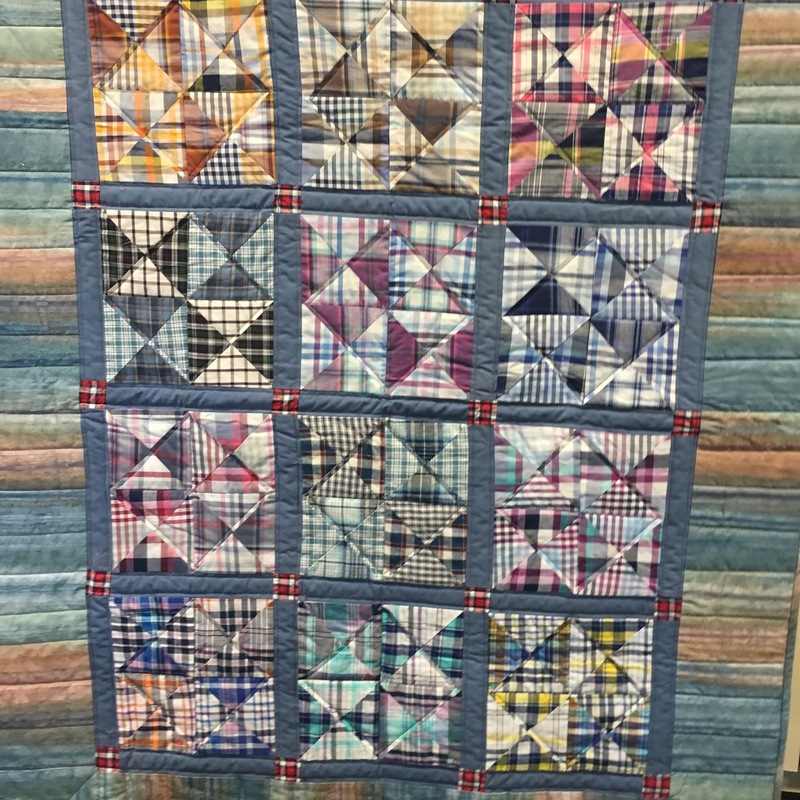 This quilt was made by the Blue Group from scraps from the cupboard. Helena made the four cute baby hats for Robyn to take to one of the many charities that she supports. 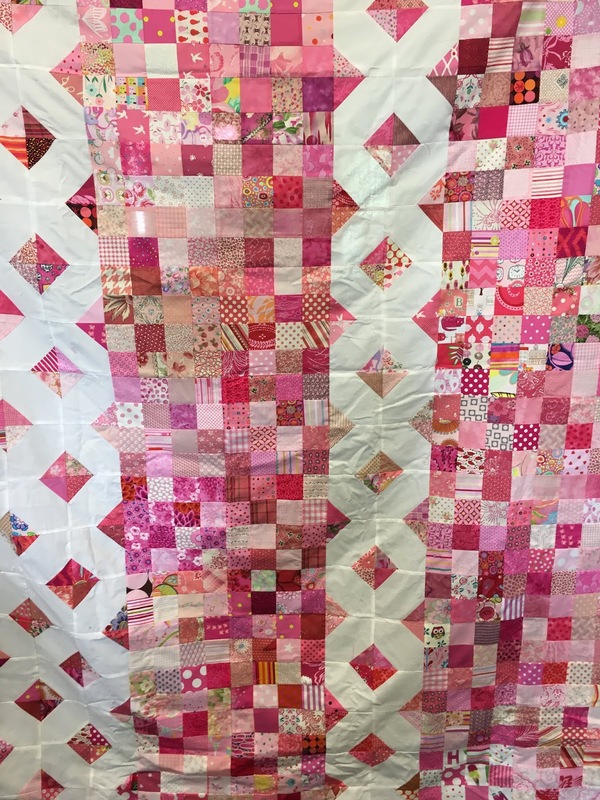 This quilt, made by the Red Group, has been chosen to go to the Sydney Community Centre to be raffled to raise valuable funds. Below is the front of the educational folder that Days for Girls has produced to explain the human reproduction system. Also I have included a photo of two of the bags that contain the undies, waterproof liner, plastic bag, and holder for each kit. Ros surprised us this week with a bag full of bunnies and bears she had made while 'baby-sitting' her sick dog. Robyn was delighted to receive them for the sensory mats she makes for children. If you intend to come to our retreat in September, be aware that there are only 3 rooms left in the motel accommodation. There is another cottage still available with shared facilities for up to 5 people as a further option. Reminder that Kangaroo quilts are due at our next meeting. Carolyn from the Grace Centre will come the following week to pick them up as well as any regular baby quilts we have. Remember to include some Aboriginal designs and fabrics in some of your baby quilts as these will go to a centre in Alice Springs. The AQC in Melbourne is on from April 11 to 14. Kathy Doughty will have a booth there. The Springwood Quilt Show is on from 26 to 28 April. A trip to the mountains is always a lovely thing to do. * Bring your machine if possible. * Bright fabric, cut into 30" x 12" to be made into bags. The fabric must be pre -washed. * An extension cord and power board if you have one. Two baby quilts from Marie K.
Three cot quilts above are all from Marie K. Robyn will take these to the Refuge for mothers and babies. 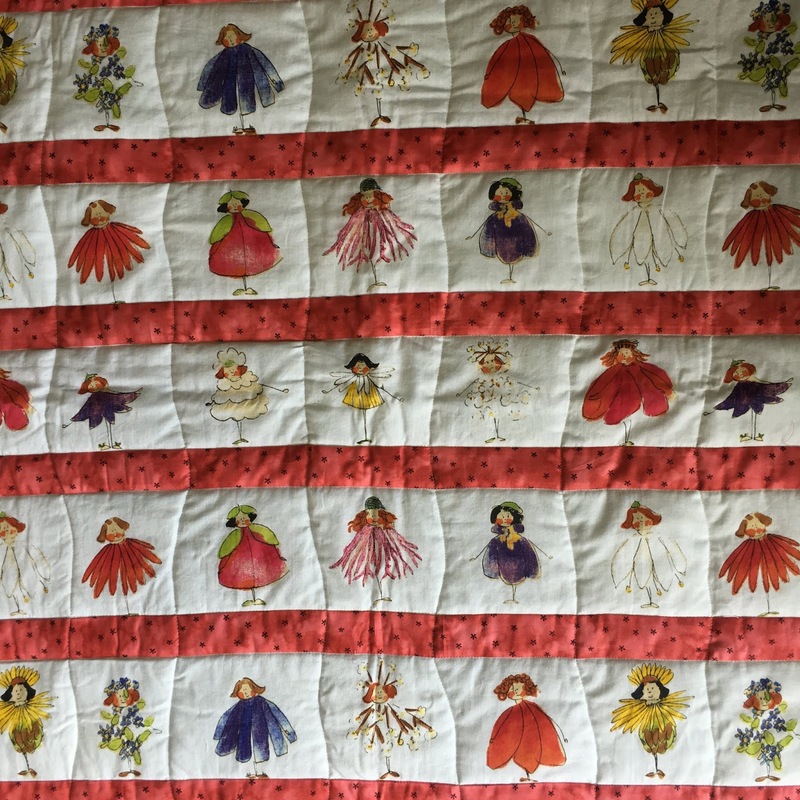 It is very sad to know that the refuges can take as many of these cot quilts as we can make. A cot quilt from Jenny for the Centre. Robyn now has 13 cot quilts to give to the Refuge. Thank you. Alison on the blog today. Quilt made by Robyn S.
Quilt made by Marie G.
Quilt made by one of our members and quilted by Susan St J. 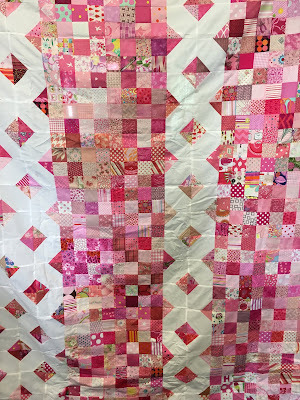 Our members have also been busy making cot quilts for a Women's refuge which will be delivered by Robyn J. More cot quilts made by Robyn J. Our Days for Girls workshop will be on our next Community Day on 4th April. Bring a sewing machine if you can and it would be good idea to throw in an extension cord or power board. 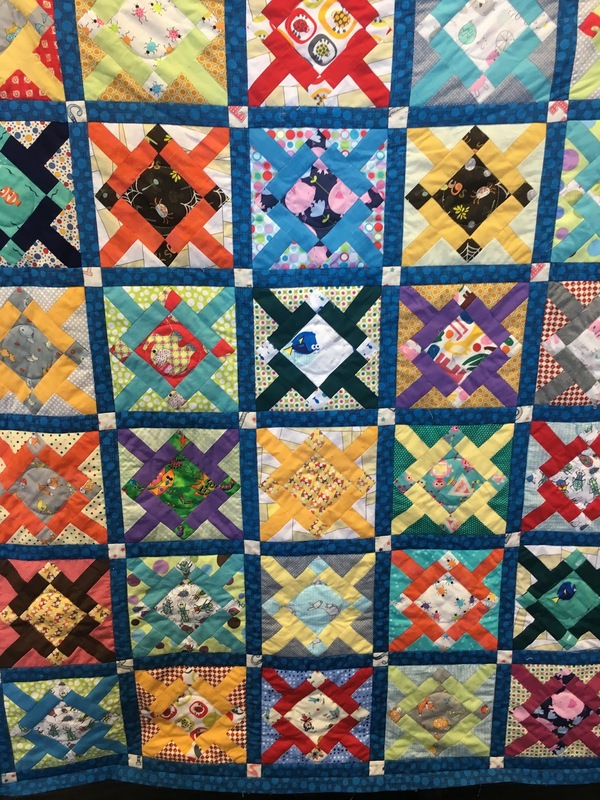 The Kangaroo quilts are also due on 4th April and will be displayed around the hall so that we can all admire our teal creations. Remember the pink blocks that we made over the Christmas break? I am a little late with the blog this week. 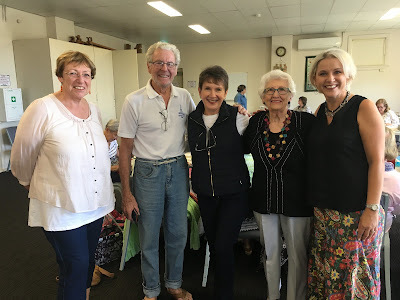 I attended an 'Away Weekend' with the NSW Guild to Berry and the South Coast from Friday to Sunday evening. It was a very full weekend and most enjoyable. These 'Away' meetings make it possible for Country Members of the Guild to attend and meet up with friends. We stayed in Nowra and on Friday visited Meroogal which is a preserved homestead from the 1800's with all the original furnishings, books, paintings, carpets etc. We visited three Quilt Shops where I did buy some fabric, even though I tried to be strong and resist the temptation! There were two highlights on Sunday. First was a visit to Bundanon for a tour of Arthur Boyd's property and contents. Then we had a speaker, Carolyn Collins, who does amazing work with plant and vegetable dyes. Carolyn demonstrated how she extracts the dyes and how to use them. A fascinating session. * Days for Girls workshop on 4 April. I believe we are going to be sewing the bags together. If you can manage to bring your sewing machine along, that will be helpful. I will have final details in next week's blog. * Visitor coming this Thursday is Tracey Sherwin from Unisson (formerly Sunshine Homes). Tracey has kindly offered to bring morning tea. * Kangaroo Quilts: These are due on 4 April. * Narelle has details of our retreat if you are thinking of coming. * Membership fees are now overdue, so please pay up if you haven't done so already. 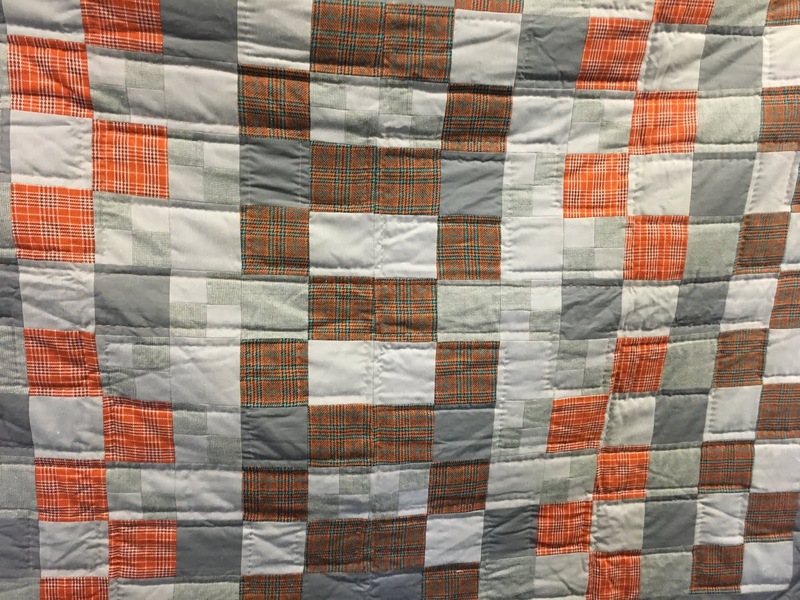 Below are two Community Quilts that Robyn Jnst. will be taking to the Pilliga region of Australia. This is an area between Walgett and Weewaa and Coonamble. There is a CWA group in the aptly named 'Come-by Chance' who help with a shelter and young families. 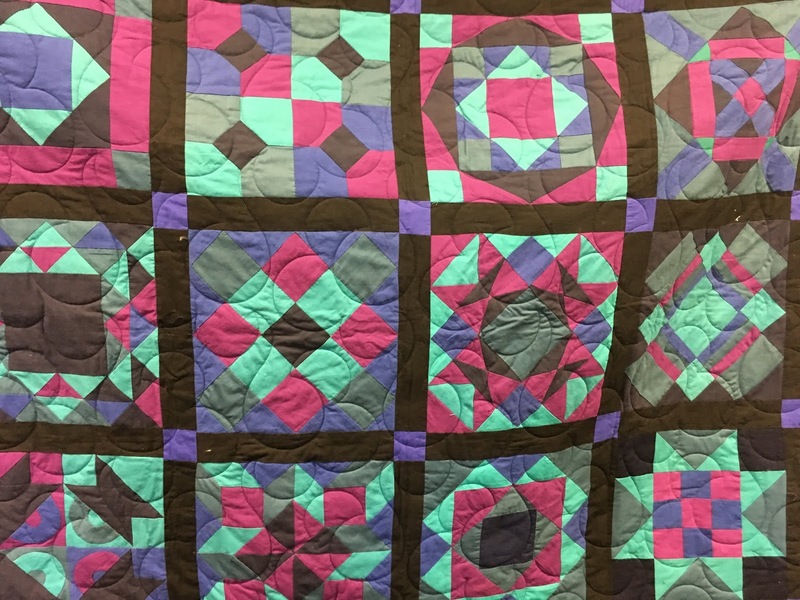 Robyn will also be taking 6 quilts that she has made herself. Below is an arrangement of baby quilts with a gorgeous little Teddy made by Bev in the middle. The three baby quilts below are from Susan H.
And 4 Baby quilts from Carolyn who is back from a lovely holiday in India. 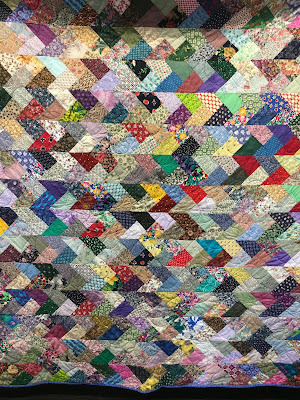 Iris made the quilt below and has hand quilted it which is always a treat. 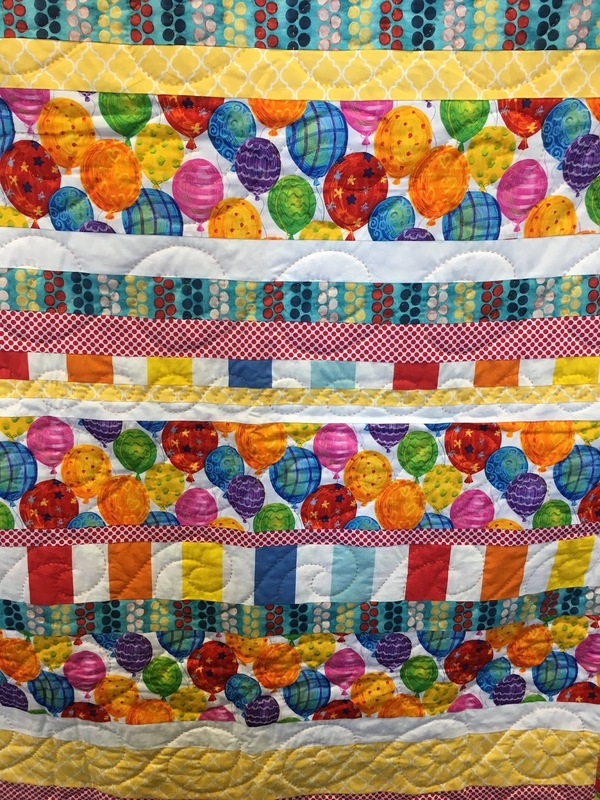 Below is a baby quilt or play mat from Grace, who is expecting her first grandchild very soon. What a great day we had this week. Alison and Helena got off to an early start with their Amish Rag Rug workshop. Many of our members were keen to learn the technique. Some found it easier than others. Getting started with the first few knots was the hardest. It was a lot of fun and you will see photos of some of the results below. Thank you to Alison and Helena. * Retreat - Narelle has a leaflet for our retreat in September. Please see Narelle for a copy if you are planning on coming. The dates are September 6,7,8. * Lindy kindly brought in a box of ripe bananas from her farm. They were all taken to be eaten for lunch or to make banana bread. Thank you Lindy. * Doreen rang to say how much she enjoyed reading our comments on her Birthday card. She enjoyed them so much, she has gone through and re-read them all. *A reminder that Fees are now due. Please see Akiko with your cash or ask her for our banking details to pay online. * Merlyn brought in an overlocker that she wasn't using. Robyn Jnst has a friend who needed one to help make the bags etc for Days for Girls. It was extremely generous. Thank you Merlyn. We had a visit from two McGrath Breast Care Nurses who work in the Northern Sydney Local Health District. They help those ladies who don't get all the benefits that the majority receive. This includes single Mothers or Mothers who are unable to work full time during their treatment, and therefore run short of money. The nurses aim is to raise money to be able to give these patients some of the benefits e.g. special bras, bandages and creams, etc. We donated a quilt for them to raffle to help raise funds. Above are examples of our work from the workshop. Above a baby quilt from Robyn S.
Above another baby quilt from Bev which she quilted it on her machine. Above two close ups from our workshop. Above the quilt we donated to the Breast Care Nurses. The quilt was made by Marie K.
It is hard to believe two months of the year have gone by already The weather is cooler and I look forward to our spectacular Autumn days. We had almost a full house this week. Marie K. brought in branches from her Bay tree for us to share. Laurel was able to join us from the Southern Highlands, and Doreen enjoyed the Birthday card we sent. Kathy Doughty also joined us for a few hours. She announced that her shop, Material Obsession, was turning 16 on March 1. An amazing milestone and all due to Kathy's hard work, creativity and enthusiasm. I am fortunate to be having classes with Kathy this year. She is inspirational and her classes are fun and informative. 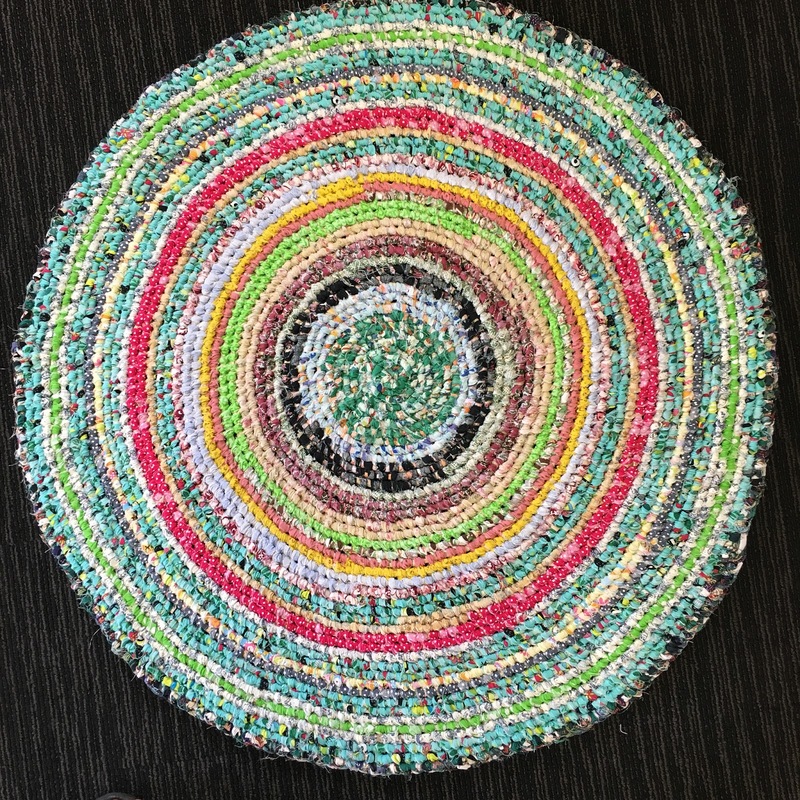 Alison spoke to us about the workshop next week to make the Amish Rag Rug.She also demonstrated how to make the wire tool to use. 1. Bring strips of fabric, 1.5" wide or between 0.50 to 2.00 inches. Cut fabric across the width and remove the selvedges. 3. Wire tool. Photo instructions below. I have some wire that is suitable and Alison also has some extras. Helena is going to try it with a large crochet hook and Robyn Jms. just used her fingers when she made hers. Whatever you use will affect how tight or loose the rug will become. Iris announced that a care nurse for Breast Cancer will come to speak to us about items that can be made and used for those women who have had a mastectomy. She will arrive around 11 a.m.
Below are a number of felt items made by Elva. There are bookmarks, keyrings, glasses cases, and hair clips. Elva and her group do wonderful embroidery and the results are bright and cheerful as well as useful. I am a klutz when it comes to embroidery so I am always in awe of those who make it look so easy. 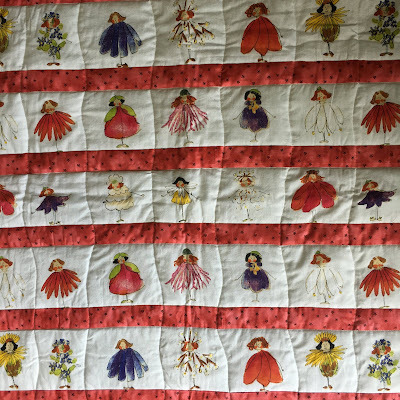 Below is a baby quilt from Jenny. 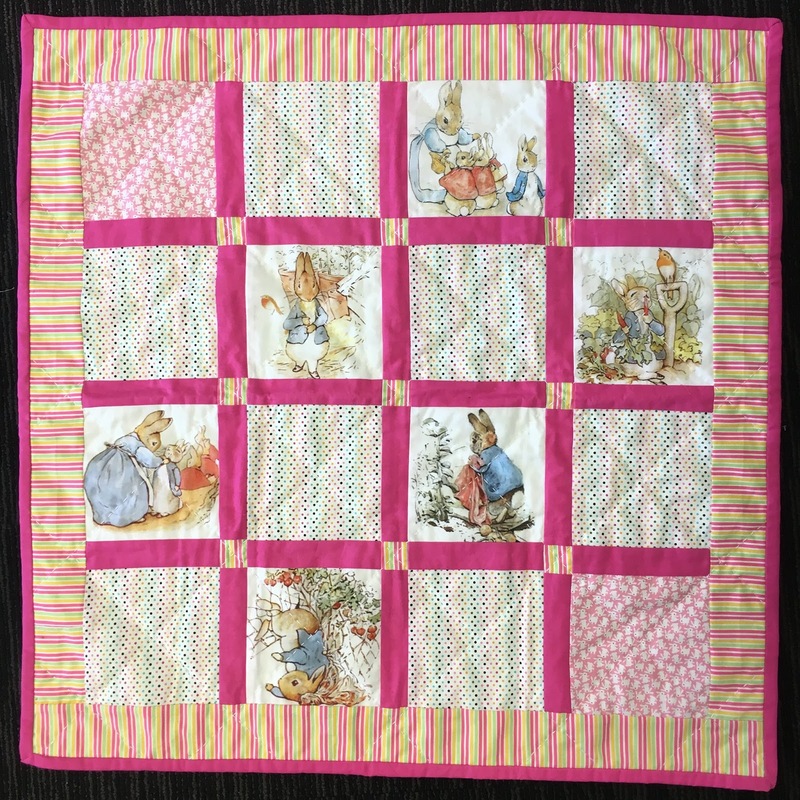 Another baby quilt from Jenny. 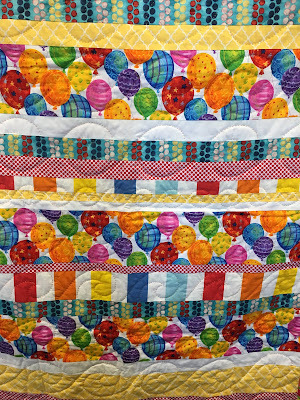 A baby quilt from Narelle using the wonky star block which is always eye catching. Below Robyn Jnst. made this quilt for her grandson. It reminds me of a Northern Hemisphere winter. Robyn also brought in a basketful of knitted baby hats and knitted bunnies. I forgot to take a photo. They looked amazing all stacked neatly together. The bunnies were just waiting for their tails. Robyn takes them to a hospital for little premmie and newborn babies. Below are the the instructions for the wire tool to make the Rag Rug.